In our Family, Holidays are extended by certain someone’s ( mine ) birthday. It allows me to make another cake and spoil everybody just a bit more. I spent days trying to decide on the flavors and decor. Until my Hubby said I should just take my favorite flavors and make them into a cake. Yes! 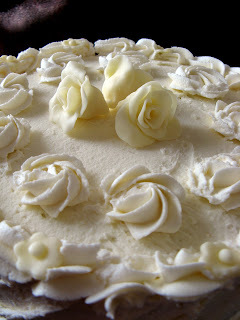 So, here it is: vanilla cake, white chocolate buttercream frosting, cranberry filling and white chocolate roses. Perfect for a birthday in the midst of Winter. White frosting matches the outdoors and cranberries are still in season ( or in few bags in my freezer 🙂 ). Now onto the roses. Oh, those roses! The white chocolate’s creamy hue makes them a perfect decoration for this time of year. And they look quite real, don’t you think? 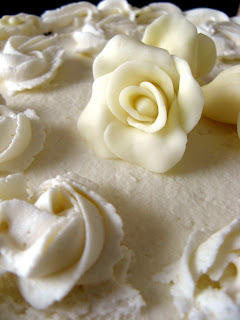 The white chocolate roses are my new favorite cake topper idea. I was blown away by how easy the are to make and how beautiful they look. 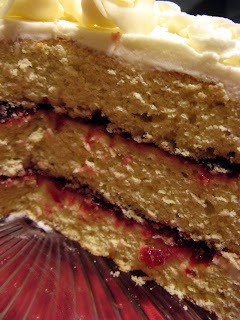 For a filling I used my cranberry jam. I hope you will like my cake as much as I did. It is my new favorite, flavors and all! Pretty! 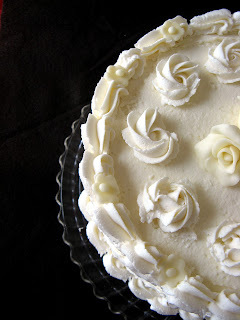 I love that vanilla cake recipe from Sweetapolita. How did you get your white chocolate roses to be so pretty? Mine always crack at the edges. Happy Birthday. Mine is fast approaching so feel free to whip one up with pistachios or coconut. Lol! I do not have your mad skills with icing. My piping technique is about equal with a 2 year old trying for the first time with one arm tied behind their back and the other arm in a sling. Seriously!! Sweet Kim! No problem! I love baking cakes for others. Besides pistachios or coconut – that would be one divine cake! Thanks for the comment and wishes! Hugs! Anna, this cake is so beautiful! You got skills, girl! Aww, thank you Daisy! Hugs! What a beauty! This cake is so lovely that I would find hard to cut through it!! I am saving this recipe to give a try. Sweet Anita! Thank you so much! 🙂 Hugs! Dear Joanne – thank you! Hi Ruth! Thank you so much! Thank you, Angie! 🙂 Hugs! Umm Mymoonah – thank you! That is THE MOST gorgeous cake! Happy birthday! Beautiful cake. It's completely irresistable. What a beautiful cake, and happy birthday!! The flavour combo sounds amazing! That cake is just beautiful! I love the decoration! Happy Birthday! So pretty! Yes, that white rose looks real. Gorgeous looking cake, love that beautiful frosting on top. Thank you so much, Sweet Christine! Sweet Lizzy – thank you so much! I am so glad you like my cake. Hugs! Hi Zoe! Welcome to CCS! 🙂 Thank you so much for a wonderful comment. Hugs! 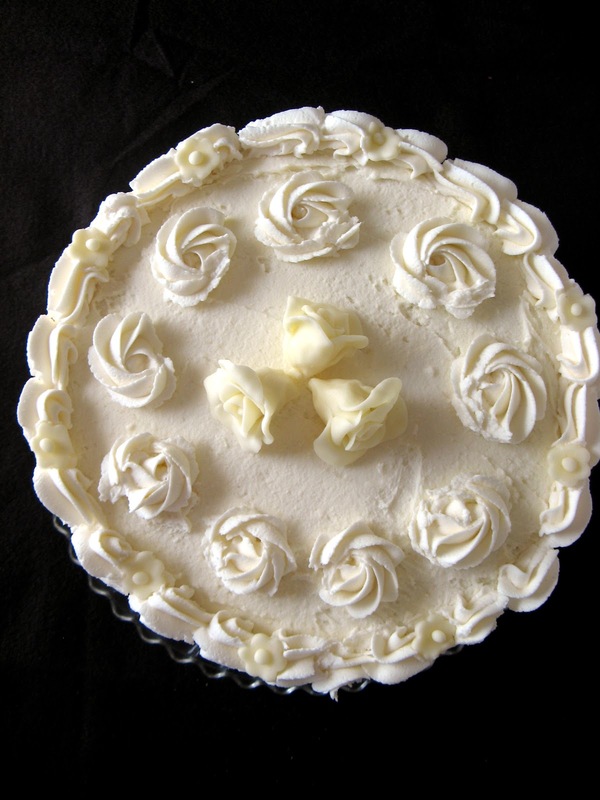 wow I know I will enjoy staying on your blog because I found out that there's a lot of delicious sweets here…I love the cake how I wish I could also make a perfect cake like this. Happy Birthday Anna! Beautiful cake! The cake is spectacular and Happy Birthday! I really like your flavor combination! Very nicely done! STUNNING, Anna! Truly gorgeous…and I'm certain delicious, too. Pinning this one for inspiration! Happy Birthday! What a beautiful cake the flavors sound awesome! Happy Birthday, Anna. This is a beautiful birthday cake and I like its cranberry jam filling. Good that I've “bumped” into your blog. 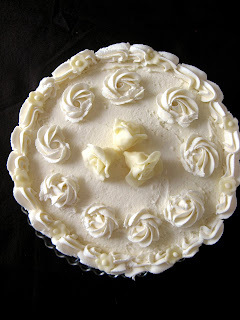 You have lots of beautiful bakes and would love to follow your blog for more. Sweet Maggie! You are so kind! I had so much fun making this cake. Wanna come over for a slice? 🙂 It sure was a special day – my Hubs and our oldest Daughter made homemade pizza! Soooo good! Hugs! Anna, you are so very talented!! I admire your decorating skills so very much!! 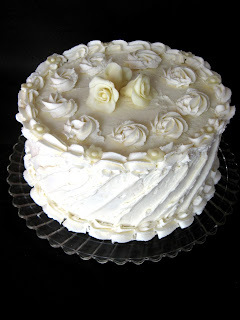 This is such a delightful and delicate cake with those incredible white roses. Truly amazing!! ooo this looks delicious! I've become quite the sucker for cranberries this year. And your roses are gorgeous! Happy Birthday Anna! This cake is drop dead gorgeous!! And white chocolate buttercream? Gimme! I was thinking last year that I need to make my own birthday cake this coming year. I usually end up with no birthday cake at all because everyone knows how I abhor store-bought cakes and there aren't any other bakers in my bunch. So, I am going to follow your lead and do this for myself this year. Hope your day was special and beautiful! Dearest Tina! Thank you so much! 🙂 The sampling sounds good to me! Almost forgot-Happy Birthday sweet friend! Enjoy your special day. This does look like an elegant as well as delicious cake. Wish we could get together for coffee or tea and sample each others cake. Yours does have some great flavor notes-yum! 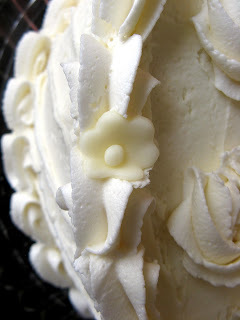 Also, this cake is decorated nicely-I like the swirls on the side as well as the little flowers. Well done!